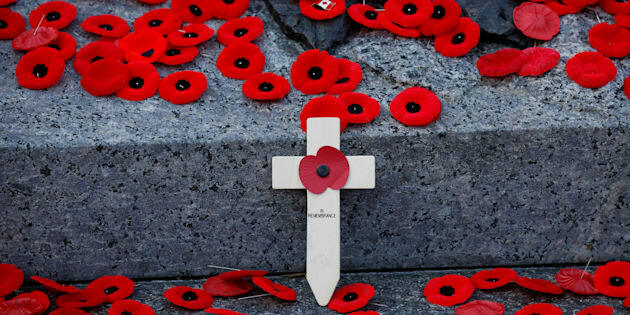 A wooden cross is surrounded by poppies on the Tomb of the Unknown Soldier following Remembrance Day ceremonies at the National War Memorial in Ottawa on Nov. 11, 2017. As Canadians across the country gathered to commemorate Remembrance Day and honour those who made the ultimate sacrifice for our freedom, photos began to pour in from ceremonies taking place from coast to coast. Here are some of the most striking images. Enormous crowds gathered in the capital for the national ceremony, which featured Julie Payette in her new role as governor general. A Canadian flag flies as people line up along Wellington Street and outside Parliament Hill's East Block to watch the National Remembrance Day Ceremony. A photograph is surrounded by poppies placed on the Tomb of the Unknown Soldier following Remembrance Day ceremonies at the National War Memorial. A veteran waves to the crowd as he arrives for Remembrance Day ceremonies at the National War Memorial. Silver Cross Mother Diana Abel lays a wreath during Remembrance Day ceremonies at the National War Memorial. Her son, Michael, died in 1993 while serving in Somalia. Defence Minister Harjit Sajjan watches a parade with Sophie Gregoire Trudeau and Veterans Affairs Minister Seamus O'Regan. People climb a lamppost to get a better view as veterans march during the National Remembrance Day Ceremony at the National War Memorial in Ottawa. Royal Canadian Air Force CF-18 Hornets fly over the National War Memorial during the National Remembrance Day Ceremony in Ottawa. Some took the time to pay special respect to Cpl. Nathan Cirillo, who was killed in 2014 while guarding the Tomb of the Unknown Soldier near Parliament Hill. People lay poppies on the Tomb of the Unknown Soldier following the National Remembrance Day Ceremony. A man touches the helmet on the Tomb of the Unknown Soldier after laying a poppy following the National Remembrance Day Ceremony. Canadians of all ages also visited the National Military Cemetery to honour the dead. A message is left at the National Military Cemetery during a ceremony on Remembrance Day in Ottawa. Master Corporal Andrew White speaks with Jack Commerford, 93, a veteran who landed on Juno Beach in World War II, at the National Military Cemetery. A Mountie wearing a poppy stands at attention at the National Military Cemetery during a ceremony on Remembrance Day in Ottawa. Corporal David Harding of the Cameron Highlanders and his son Silas, 8, visit the National Military Cemetery during a ceremony on Remembrance Day in Ottawa. Elsewhere in the country, Mayor John Tory met with veterans in Toronto, as hundreds gathered downtown to commemorate the day. The mayor also attended a ceremony at Prospect Cemetery. Mayor John Tory attends a Remembrance Day service at Prospect Cemetery in Toronto. Toronto Police Services march before a Remembrance Day service at Prospect Cemetery in Toronto. Manulife's headquarters also planted thousands of Canadian flags to honour the fallen. Premier Kathleen Wynne also commemorated the day at Queen's Park. Kathleen Wynne attends a Remembrance Day service at Queen's Park in Toronto. A member of the Canadian Military places a poppy on the public wreath during Remembrance Day services at Queens Park in Toronto. Members of the Canadian Military stand in formation during Remembrance Day service at Queens Park in Toronto. Toronto also paid tribute to the Canadian soldiers who died in the Korean War. A Canadian flag flies on a Rose of Sharon tree as a tribute honoring the 516 Canadian troops who lost their lives in the Korean War (1950-1953) ahead of Remembrance Day at the Rose of Sharon Garden in James Gardens in Toronto. Participants tie red ribbons on Rose of Sharon trees in honor of 516 Canadian troops who lost their lives in the Korean War (1950-1953) ahead of Remembrance Day on Nov. 10, 2017. In Calgary, snow didn't stop people from showing up in droves to the Field Of Crosses to thank veterans for their sacrifices. Sarah Markovich places a carnation on the grave marker of a veteran following a Remembrance Day service in Calgary. Lyn Moehling looks for the grave marker of her grandfather, WWI veteran Noble Edgar Taggart, following a Remembrance Day service in Calgary. A young girl plays amongst veteran's grave markers following a Remembrance Day service in Calgary. In Winnipeg, people gathered around a cenotaph despite the cold to honour the fallen. Isolde Chisholm pins her poppy to a wreath with the help of her aunt Rosemund Ragetli at a cenotaph during a Remembrance Day service in Winnipeg. Poppies are placed on a wreath at a cenotaph during a Remembrance Day service in Winnipeg. Private Quincy Burrowes with the Royal Winnipeg Rifles stands on vigil guard at a cenotaph during a Remembrance Day service in Winnipeg. Royal Winnipeg Rifle skirmishers stand vigil guard at a cenotaph during a Remembrance Day service in Winnipeg. In British Columbia, Premier Horgan spoke at a solemn ceremony. Premier John Horgan delivers a message during the Remembrance Day ceremony at Veterans Memorial Park in Langford, B.C. Military, RCMP, cadets and people look on at the Vimy War Memorial where wreaths lay during the Remembrance Day ceremony at Veterans Memorial Park. A young boy joins in a moment of silence during the Remembrance Day ceremony at Veterans Memorial Park. Langford also hosted an Aboriginal Remembrance Day ceremony. Royal Canadian Navy Master Cpl. Sarah Thomson looks on during the Aboriginal Remembrance Day ceremony at Goldstream Park. Vancouver highlighted the diversity of our country's veterans during some of its ceremonies. Veterans wait to march during a Remembrance Day ceremony honouring the sacrifices of the early Chinese pioneers and Chinese-Canadian military veterans, in Chinatown in Vancouver. Second World War veteran Patrick Drake, 92, attends a Remembrance Day ceremony in Vancouver. Other powerful images also came out of Halifax. Members of the Canadian Armed Forces participate in Remembrance Day ceremonies at the Grand Parade in Halifax on Saturday, Nov. 11, 2017. Poppies are placed on a cross during Remembrance Day ceremonies at the Grand Parade in Halifax. Montreal also commemorated the emotional day. Veterans salute during a Remembrance Day ceremony in Montreal. Members of the French Navy march during a Remembrance Day ceremony in Montreal. This story has been updated to include other Remembrance Day ceremonies.